The Irish are known as great storytellers, and most popular Irish gifts do have something to say. The symbols you find on everything from Celtic jewelry to delicate Belleek vases to snuggly Aran sweaters are a whole language reflecting Ireland’s complex history and rich culture. And many of those intriguing symbols have a romantic meaning and history. If you are looking to give someone you love an Irish Christmas present, you have a chance to use the beautiful lexicon of symbols to say something more than Merry Christmas. It’s a fairly large lexicon of symbols too. This small island is bursting with creativity, and while we are best known for literature, we have a heritage full of arts and crafts ranging from the Book of Kells to simple straw St. Brigid’s crosses and sparkling crystal to cozy knitwork. And of course, jewelry. We’ve been making jewelry since the Bronze Age, and you can find all styles of Celtic jewelry featuring beloved Irish symbols and designs. The distinguishing feature of Celtic knotwork is that it has no beginning or end. The entwined lines can be bold or delicate, complex or simple, but they never simply break off at a dead end. That is deliberate. The infinite patterns represent eternity, which makes a powerful statement to someone you want to spend your life with. Celtic knotwork is featured on all kinds of Irish jewelry – including engagement rings – as well as clothing and decorative items. The trinity knot is a particularly popular Celtic knot with three loops. The number three had a lot of meaning to the Celts, and they used it in many designs including the famous triple spiral of Newgrange. When Christianity arrived in Ireland, the symbol was quickly used for the Holy Trinity of Father, Son and Holy Spirit. But before that, it was used to represent the Celtic triple goddess. The trinity knot is widely used to symbolize important trios such as body, mind and spirit; the three ages of life (maiden, mother, crone) and of course past, present and future. That last one has a nice, romantic touch if you want to tell someone you treasure your shared past, love your present time together and want a future with them. The Claddagh is the most romantic of all Irish symbols, and it has a classically Irish story of romance and tragedy with a happy ending behind it. An Irish fisherman was abducted at sea off the coast of Galway and sold into slavery. He served a goldsmith, and while in servitude he created the design for his beloved back home. He ultimately gained his freedom, made his way back to the Claddagh village in Galway and wed his faithful beloved with the ring he made. The heart is love, the hands friendship and so poignantly in this story, the crown is for loyalty. Many Irish symbols have a romantic angle to them. The Tara brooch is named for the place one was found, the Hill of Tara, which was the seat of royalty. So it is a fitting present for the queen of your heart. The harp has long been a symbol of Ireland, and you can find it on many Irish gifts for the one who makes your heart sing. 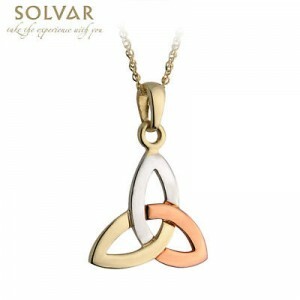 Or you can say it plainly with Irish jewelry featuring the words ‘mo anam cara’ – my soul friend or soulmate.